Before I got married, I was all about weddings... could not get enough of them. More-so the fact that before I knew my husband would be my husband I had my wedding book filled with inspirations from color themes to locations. I even sketched my dress (thankfully I had the amazing Kosibah save me from myself). I love hearing stories of how the couples met, their grand ideas for their big day and what they were looking forward to the most. For me being in the brides room and being a part of her special day gives the most rewarding feeling ever (shout out to all our brides to date for trusting us to style them and get them ready). Whilst very emotional it can also be comical. 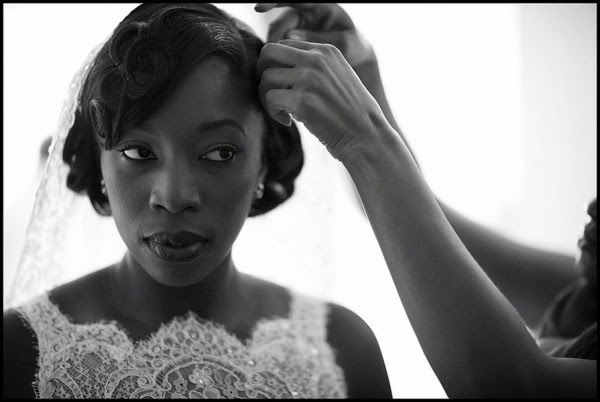 There are no two brides that are the same; you get the calm, cool collected bride and you get the wild fun can't seem to sit still kinda bride (I fell into the latter category - my make up artist - Elaine at Shomya told me this repeatedly *face covered*). Yet what amazes me the most is how brides cope gracefully when things sorta go of course - as they do with weddings. I had a bride a few years ago, who the night before her wedding received a call from the vicar that the church had flooded (deep breathe). She simply called me in the morning just as I was about to set out to her and said "take your time - no need to get here till later" confused I was like uh? At which point she explained what had happened and as such needed some more time to re-work logistics for the day. Luckily her reception venue had a licence for weddings and they simply had to contact all their guests and inform them of the new location and timing. Things worked out beautifully in the end. I also remember getting a call from a bride as I was pulling up at her location that she was having dress issues (I freaked thinking crap not the wedding dress!) alas it was her second dress so worst case scenario she would have just ended up staying in her wedding dress. Luckily order was restored thanks to a dutiful and diligent bridesmaid! Which brings me to the topic of bridesmaids - it's not about you! So remember when your asked to be one be the best that you can be and support as best as you can and if you feel at any point that supporting and being called upon to run errands aren't your thing then gracefully decline the position. Nothing worse than a bridesmaid that thinks she's the bride. Brides - no matter how tough it gets hang on tight because I promise you that at the end of the day all that will matter to you most is that you've said "I will" to the man of your choice and your about to begin your happily ever after. Chose the battles you fight during the preparations carefully and focus your energy on your marriage and making it the best! There are many happily married couples, who chose daily to work hard at a fulfilling and enriching marriage - make yours one of them. We recently posted a picture regarding washing your mane and how often your mane should be washed. we advised at least once a week and if you can opt for every three days (personally I try to wash every three days especially when I have also been to the gym). And we had a comment stating that black hair should not be washed that often and we were being ignorant and doing a disservice. Lets apply some common sense to this process, Caucasians typically wash their mane every day (and more than once a day in some cases), and the fact is majority of Caucasians enjoy the benefits of healthy mane. our scalp is a type of skin and one could argue that everyday washing would dry out the skin on your body so you should only wash once or twice a month (you might find that people no longer want to stand next to you). It is not the frequency of washing your mane that causes damage to your mane, but rather what you wash your mane with and how. This is where choosing the right product is important, water (aqua) should be the first on the list of ingredients for any product you use, silicones and the like should be way down the list!! 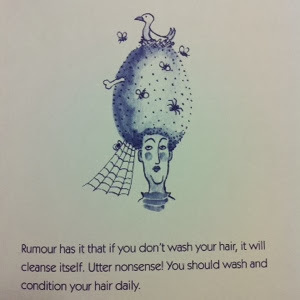 Did you know that 48 hours after washing your mane your scalp is already dirty and the build up of dirt can lead to various scalp issues like dandruff. SO when you apply oils and you've applied everything on earth to your scalp and yet that dandruff persists you'll know why. 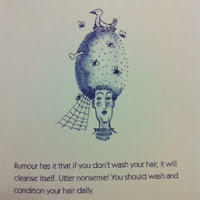 Dandruff & Dry Scalp whilst they may look similar are very different scalp problems and should be treated differently. Art of washing your mane requires great care, here's our simple guide. Wet Mane - your mane should be soaked with warm water before the application of shampoo. Gently brush your fingers through your mane to ensure that water is evenly distributed throughout. Shampoo (ph balanced & formulated for dry mane)- pour some shampoo into the palm of your hands (or better yet still dilute the shampoo in some water) and rub your hands together to build up a later before gently applying to your mane and scalp. use the ball of your fingers rather than your finger nails to massage your head gently (soft kneading motions) and every so often run your fingers through your mane gently to ensure your strands are not tangled. If your washing your mane frequently you'll find that you need less shampoo and one shampoo will be sufficient - hence the statement that regular shampooing will damage your mane becomes redundant. 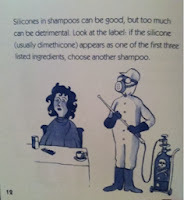 Gone are the days of brown greasy water leaving your head! Rinse - this is the crucial part, you need to rinse thoroughly and just when you think your done rinse some more. 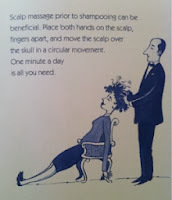 Condition - apply conditioner and cover with a shower cap for 5 - 10 mins. We will finish on this note your mane is one of the strongest membrane on your body it's not as fragile as you might think as the average head of mane can support 23 tons of weight yet you need to be gentle- soft hands. So if you have been washing your mane once or twice a month, we'd like to challenge you to up the number of times you wash your mane for a healthier looking mane. as always love your mane. ps. 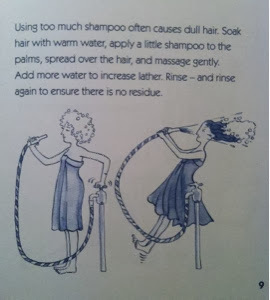 enjoy the animation and tips from the book happy hair days by philip kingsley (renowned tricologist) with over 4 decades of experience.